Home Movie Do you want to change your face like this? Do you want to change your face like this? If you include a big fan of the comic, it looks like you should start to limit your imagination. A man in Caracas, Venezuela, just change the total shape of the face in order to follow one of his favorite comic characters. Henry Damon, 37-year-old man who changed the face that looks similar to the one villain in comic Marvell. Yes, Damon makes the structure of the head and face so much like the character Red Skull. Not just scrape nose, Damon also add some implants in the forehead. In fact, he made tattoos red color almost all face. This crazy steps taken Damon when he dreamed of becoming the Red Skull figure after meeting Emilio Gonzalez, a medical student who came out and become a tattoo artist and body modification. According to Gonzalez, Damon had to undergo a psychological evaluation before the start of the transformation of his face. But, all that changes is told Gonzalez was only the first step. 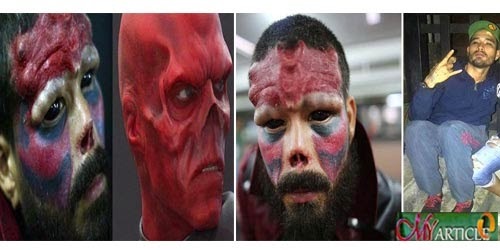 After the tattoo in almost the entire face, Damon still would soon resume some final stages covering the implant entire face, then became a Red Skull. Indeed, true fans will do anything for it admired. But if to alter and destroy a face like this, I think it does not really. If you think how?